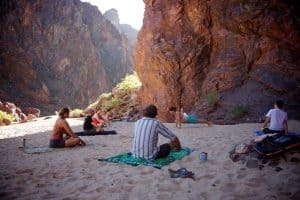 On a Grand Canyon raft adventure, an environment of extremes, it is crucial that you take an active role in your self-care. You may be hot and sunbaked, or freezing cold and wet, sandy, tired and exhilarated throughout your adventure. Check in with your own self at least once a day. Ask yourself some basic questions. And most importantly, consider incorporating in some raft adventure daily yoga stretches. These simple things will help you take a holistic approach to your well-being. Have you been eating a variety of foods? How is the skin holding up on your hands and your feet? Do you have a sunburn? How did you treat it? How can you further protect your skin from the sun? Do you have any cuts or scrapes? How are they healing? Have you had a bowel movement recently? Do you have any muscles or joints acting up? Is there anything you are experiencing that you think could become a problem? During the morning talk from one of your guides. During lunch preparation (the river guides are typically preparing lunch). Waiting in line for the bathroom. Floating in the boat on the water. Sitting on your paco pad right before you roll out your sleeping bag at bed time. Guests who are familiar with yoga recognize these raft adventure daily yoga stretches and poses but really anyone can do them. Raft adventure daily yoga stretches are not just yoga poses but stretches that help loosen, relax and strengthen the body for the duration of your expedition. Yoga, or concentrated stretching, gives you a chance to listen to your body. It is also important to note that this is not medical advice and one should seek the consult of a physician if you have any questions. 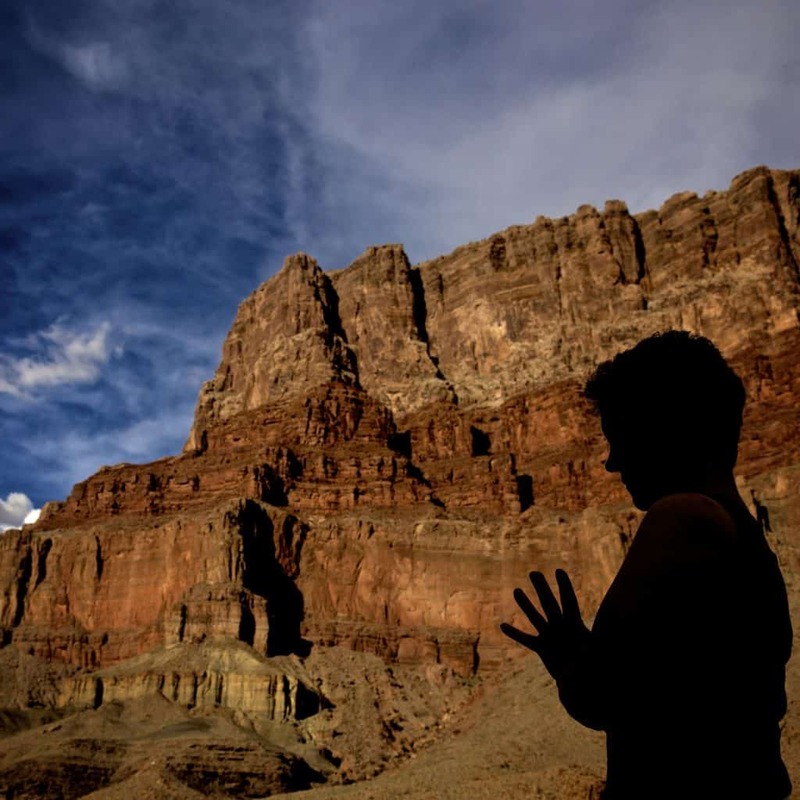 Laura Fallon held a one hour seminar with our staff to remind everyone ways to initiate self-care while on a Grand Canyon Raft Adventure. She reminds us all that we need to take an active role in not only our own care, but also the care of those around us. She advises 10 essential raft adventure daily yoga stretches that you can do right on your paco pad. Laura named it, 5 Minute Sleeping Bag Series II. A printable guide of raft adventure daily yoga stretches. 1) Cat Cow: Warms up the spine and loosens the lower back. Helps concentrate breathing. 2) Side Body Stretch: Shoulders and upper back, stretches the side of the body. 3) Thread the Needle Lumbar Twist: Opens up the spine and shoulders. 4) Core: Focuses on the core. 5) Seated Arm Stretch: Stretches the back and front of shoulder. 6) Eagle Arms: Opens up the shoulders. 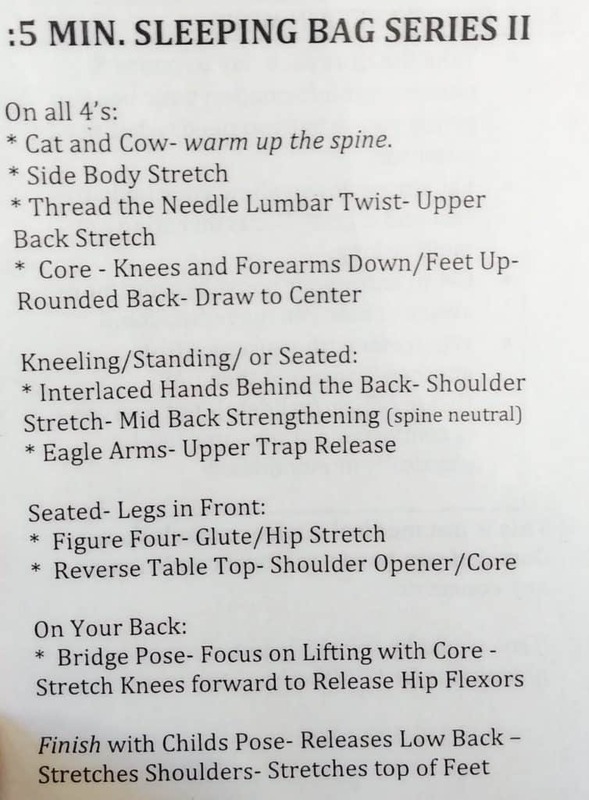 7) Seated Threading of the Needle: Also known as the figure 4 stretch and focuses on glutes and hips. 8) Reverse Table Top: Targets arms, shoulders and core. 9) Bridge Pose: Stretches the chest, neck, spine and hip flexors. 10) Childs Pose: Stretches shoulders, low back and the top of the foot. BONUS 11) Wrist Stretch: Helps release tightness in hands and palms. Watch Laura’s entire video for self-care advice or start the video at about 25 minutes in for examples of the raft adventure daily yoga stretches.